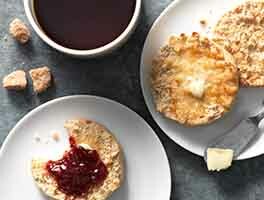 These big, thick, homemade English muffins are wonderful toasted and spread with butter and jam, of course; and they're also a nice size for breakfast sandwiches. 32 mins. to 35 mins. 2 hrs 17 mins. to 2 hrs 20 mins. Combine all of the ingredients except the semolina in a mixing bowl, or the bowl of your stand mixer. Mix until everything is combined, then beat at high speed (using the flat beater paddle, if you're using a stand mixer) for 5 minutes. The dough will be soft, sticky, and glossy. Scrape down the sides of the bowl, cover it, and allow the dough to rise for about 90 minutes, until it's just about doubled in bulk. Heat an ungreased frying pan or griddle over very low heat; a griddle with a thermostat should be set at 300°F. 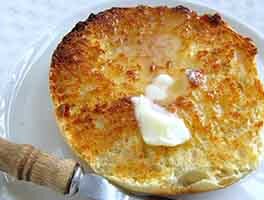 You may want to make one test muffin first, as follows: When the griddle or pan is up to heat, place one well greased 3 3/4" English muffin ring in the pan, and sprinkle a little semolina inside the ring. Scoop a scant 1/2 cup (2 3/4 ounces, 78g) of sticky dough out of the bowl; it's easiest if you rinse your measuring cup and wet your fingers before adding the dough to the cup. Use your wet fingers to shape the dough into a circle about the size of the ring (don't stress about being too exact), lay it into the ring, and sprinkle the top lightly with semolina. After 7 minutes, check the bottom of the muffin; it should be a medium-golden brown. If it's not, turn up the heat; if it's too brown, turn down the heat. Cook for another 10 minutes, then use a pair of tongs to grab each side of the ring. It might lift right off; if it does, lift it off, set it aside, and use a spatula to gently turn the muffin over. If it doesn't, flip the muffin over, ring and all; then gently wiggle the ring around until it comes off. Cook the second side for about 15 to 18 minutes, until it's a deep golden brown. If you have an instant-read thermometer, the interior temperature will be about 200°F. Remove the muffin from the griddle, and gently split it open. If it appears to be done inside, cook the remaining muffins the same way. If it's still gummy or wet, turn the heat down a bit and cook the remaining muffins a bit longer on each side. When the muffins are brown on both sides, transfer them to a rack to cool. Store in a plastic bag for 5 days, or freeze for up to 3 months. To make breakfast sandwiches: Fry 2 slices of bacon or one sausage patty for each breakfast sandwich. For ham sandwiches, cut baked or boiled ham into rounds the size of your muffins; this is easily accomplished by using one of the muffin rings as a cutter. Cut sliced cheese into muffin-sized circles the same way, if you like. Split, toast, and butter breakfast sandwich muffins, and set aside. Fry or scramble an egg for each sandwich. To assemble sandwiches, place meat on bottom half of muffin. Top with egg, then cheese. Place under broiler for a minute or so to melt the cheese. Top with remaining muffin half. 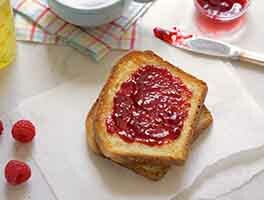 To prepare sandwiches ahead: Assemble the sandwiches, but don't broil them. Wrap and refrigerate. To serve, remove from the refrigerator, and place on a parchment-lined baking sheet; the parchment will catch any dripping cheese. Lay another piece of parchment over the sandwiches, and another pan on top of that; this presses them down slightly, and helps the filling meld together nicely. Bake in a preheated 350°F oven until the cheese melts, about 15 to 20 minutes. Serve hot or warm. This recipe was pretty easy, so much so that my husband jokingly asked why I haven't been making them for the last 15 years. I found them a bit sweet. Next time, I will try cutting back the sugar. I also will use the 1/3 cup of dough per ring like other reviewers have suggested - 1/2 cup made them very thick. I hope to make these on a regular basis - they were definitely a hit with the family. The taste was pretty good with the pizza dough flavor...much, much better than store-bought ones! This was actually easier, simpler & quicker than expected also so, in the future, I probably will make these instead of buying some, even if they are on sale & I have a coupon! One itsy-bitsy bit of advice. The recipe mentioned using tongs to flip the rings & muffins. Apparently they forgot to include the following line. "DON'T TOUCH THE RINGS WITH YOUR PINKIES BECAUSE THEY ARE HOT, YOU DUMMY." Enough said, because what do you think I did? Argh!!!! These are Great! I followed another reviewer's advice and baked them between two sheet pans. Fantastic! The 90 minute rise does make it a little hard to get these on the table for breakfast, but well worth it. Could the dough be made the night before? Absolutely amazing! Hubby won't let me buy from the store after making these. So addictive! 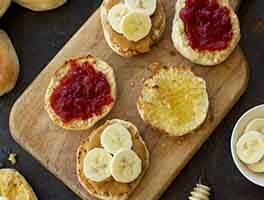 I tried several different English muffin recipes and this is my favorite one. 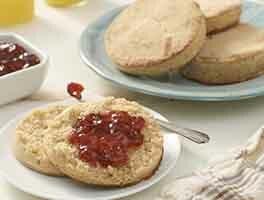 I bake them in the oven though, using the instructions from the KAF “Baked English Muffins” recipe. I have made them about 6 times and once took them to work (baked the night before) and they loved them. I usually let the dough rise for 90 minutes, then refrigerate overnight. I use an ice cream scoop (cup cake size) to scoop the dough in the rings. They still taste good the next day when toasted. I made this recipe a couple of hours ago and loved it. Can't stop eating them. The dough was really wet, just slightly drier than a batter. I put 1/3 cup of the mixture inside of each muffin ring and cooked on low. Later, I split them with a fork. Awesome peaks and valleys, just like commercial muffins. One warning, as the recipe states, do not get the pan or griddle too hot. My Viking range was just slightly too warm on the lowest setting so the outside was quite dark before reaching 200 degrees internally. Next time I'll use a heavier griddle or pan. I'll bet a big cast iron pan would be terrific. I would have given it 5 stars but I think the recipe could use some tweaking for additional flavor. I'll have to think about that. Anyway, my score was more like a 4.7 instead of a 4.0. I would recommend these to friends if they were looking for a bread like muffin. I baked them in the oven and then split them and put them under the broiler for a few minutes to crisp them up. They taste fine if that what you're looking for, but I was looking more for the English Muffin taste and these don't have that. The muffin rings are wonderful though. What can be substituted for the english muffin rings?
" You can cut the bottoms from clean, empty tuna cans and they will make a great substitute. 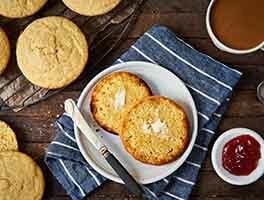 These are absolutely delicious and have all the wonderful nooks & crannies I couldn't seem to get with other recipes. I took a cue from Alton Brown and baked them in the oven. I laid a silpat (or parchment) on a sheet pan and put semolina and about 1/4 cup of batter in each muffin ring, then topped with more semolina. I put a silpat (or parchment) on top of the rings and laid another sheet pan on top. I baked them at 400 degrees for 20 minutes and then removed the top pan and silpat, flipped the muffins, and removed the rings. Another 10 minutes in the oven and they were perfect!! Plus I didn't have to stand at the stove to babysit them. With four kids I really don't have that luxury.